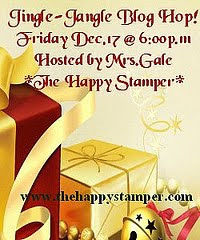 The Happy Stamper :): Ruthie's Banner Blog Hop!!! Episode 177 ~ "Gobble, Gobble Mr. Turkey!" Mary's Mini Album Blog Hop! Episode 172 ~ My "200th" Subscriber Give-Away! Episode 173 ~ "And The Winner Is..."
What a cute banner! I love it! Your banner is so awesome! I love the boa on the top....TOO CUTE! I became a follower...thanks for the blog candy! I love the banner Gale. Very pretty. Thanks for sharing and the giveaway. Great banner and a great video. Dispite your flood, you are so awesome to stay in the hop. Thaks for the chance to win some awesome bolg candy. I am amazed that you managed to finish your beautiful banner even with all the chaos at your house from the flood! Here's hoping that your perseverence in making a New Year's banner is a sign of a beautiful new year for you and your family post flood! Great New Year's banner. Hope everything gets dried out and no mold. Thanks for a chance to win your giveaway. Gale loved the banner and the use of the clothespins and boa. Great website, I will be following your 'use it or lose it' series and hope to get more inspiration. Thanks for the opportunity to win your blog candy, just love the paper pkg. OMGosh Miss Gale! I LOVE it! Leave it to you to bring on the glitz and glam! The boa makes it PERFECT! OHH I love this banner!! I like how you used the martini glasses instead of the reg. pendants. Cheers! I love it. Very cute. what a wonderful idea!!! Our New Year's tradition is hot fudge sundaes at midnight, so I may alter your idea a bit, but will definately use the martini glasses for my next girls night party! Thank you for the generous candy, too! Great banner.Sorry to hear about your water damage. You have such a positive attitude! I just became a follower. Thanks for the chance to win. What a fun banner! I recycle my cardboard boxes, too! Cute banner...THANKS FOR A CHANCE TO WIN. What a great idea! Love the colors, I have the 4x6 pack of that same paper and now I can see other uses than just girl pages. Thank you for sharing your adorable banner! I think I missed that stack yesterday when I was at my JoAnns... but it was soooo busy! I am a new follower. I love the Banner! That is an Awesome idea to do for New Years! We don't go out either so it's a fun idea to make it more festive at the house. Nice Giveaway! Very Cute! Love the Blog Hop! TFS! Love the Cheers banner... Good luck with the house flooding, so sorry that that happened to you, hope it all works out! !Great Prize!! What a "Cheer"ful banner! Very pretty! I just found your blog today! I am so glad I did. You are so talented. I love the banner colors! I'm new to scrapping. Super cute banner! Love the martini glasses. I collect painted martini glasses and your banner would fit perfect in my house!! Love that musical note paper that is in the combo christmas pack! Great video. I am a follower! I love the colors that you used, I am a big fan of DCWV! I LoVe Your "Cheers" Banner!! It's gorgeous!! So Festive!! Especially the Boa!! Love it! Super, super cute!!!!!! This is so me!!! I'm so excited to have found your blog and became a follower.... I can't wait to see what else you come up with. I would love the chance to win this paper...super cute. Thanks so much for sharing. I LOVE your blog...it's super cute. I would love for you to stop by and visit sometime. I like how you used a martini template to create your banner and the white boa looks great with it! Thanks for sharing and a chance to win! LOVE that you went away from the traditional shape of a banner. Looks great. Love it. Love your banner! Great job :) I'm now a follower and I hope you will come check out my blog as well! this is so cute, you are like the glitter queen. My kind of banner, I love it!!! Great Job. Thanks for the chance to win. I am now a follower. Love your banner, very chic. Thanks. Loving the Martini glass banner. Thanks for sharing. Your banner is great. Thank you for offering such generous blog candy. I have checked out your blog, love the video format and have become a follower. I hope you are drying out. this is perfect inspiration needed to get me ready for the new year. thank you for that. banner rawks. Love the banner! turned out get thanks so much for sharing.. Yay Im follower #100.. thats just exciting I've never been anyones special number follower lol! Thanks for the chance to win all your great candy! So cute! Keep it up! Oh great banner, love that stack I have it and also the album. I really like the boa that you hung it all from. Great idea. Thanks for sharing. I am now a follower. Wow that is one festive banner and I love it! New follower!!!! Such a cute banner...hand-cut glass as apposed to hand-blown. I am so jealous, I can't cut a straight line to save me. With all that going on with your house, THANK YOU FOR DOING THIS!!!. This is wonderful. What a cute banner. I am now a follower. I love Mary. Is she not great... I have a small blog also and would love to have you follow me... Thanks for the giveaway. Looks like you're ready to party! Love the banner. TFS! Nice!! Love the New Years Banner - nice change of pace from the Thanksgiving ones too! Great giveaway also. Thanks for the chance to win. Way cute! I'm totally feeling inspired. Wonderful Beautiful Banner! I just love pink. Also, what an awesome giveaway. Just became your newest follower. Would love for you to check out my blog. WOW PINK, Boas, Martini glasses . . . how much better than that! GREAT SHARE! your banner is FABULOUS!!!! Love it. Fantastic Banner! I just became a follower and I can't wait to check out the rest of your videos. Thanks for the chance to win some great blog candy! Nice banner. I like that you cut the martini glasses by hand. Love your idea for the New Year's banner! I am now a follower and can't wait to see more of your projects! Hi Gale ~ I am new to your blog. I am so glad I found you. I love that about blog hops. 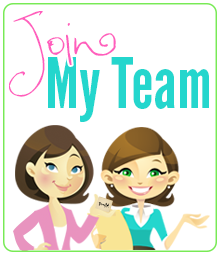 You can discover new blog buddies and creative souls. I really adore your banner. It is fab! Thanks for sharing it. Sorry to hear about your flood. That was me a year ago with no family around to help and my husband was deployed in Germany. It was tough but I got through. You have a great attitude. Just love your enthusiasm. I am now a follower! Thanks for sharing..I LOVE it! Love the prizes you've chosen also..thanks! This banner is adorable and what a great idea for New Years!! I'm definitely gonna have to make one now. :) thanks for the inspiration! I love your blog and your videos! Awesome banner! So cute!! I so want to make one of these! loved the banner!! !would be great for a party!!!! Your blog is great... and your banner is beautiful. Glad I found you through this hop! Thanks for a chance to win some candy! I love the pink/black combo so cute for New Years! Thanks for the chance to win! Love your banner. The glitter is really great. Thanks for a chance to win an awesome prize. Love this banner! The sparkles, the glittered clothes pins and the fun boa! I will be back to watch more videos! Your blog is fantabulous! I love that I found you from this blog hop because we seem to really be alike because I love bling as well! Thank you for sharing such a wonderful banner! Sorry for the choas at your house... You did amazing with banner and video! just became follower- first time visitor! What an adorable banner. I'm glad I became a follower. Such a cute banner, now i'm ready for new years! Very cute banner, makes me happy! totally off topic but I do love your nail color!! And I love how your banner turned out! ThAT IS THE "MUST HAVE " BANNER FOR ANY GIRL GET TOGETHER! Love it! I'm loving everyone's banners so far. Really liking this one. Happy New Year...lol. Smooches..
Hi - just found your blog. So sorry to hear about your flood! The banner turned out great despite that unfortunate event. I'll take a martini..two olives please...lol! Love your banner! I love your banner - I never think to decorate for New Years! What a great banner you really used your imagination to come up with this Idea. So sorry to hear about the flood at your house! Yikes! 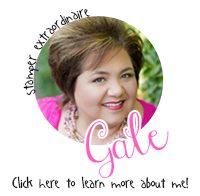 Love your banner and your blog!! Great videos/tutorials! Super job! love the banner! looks great! this is a great giveaway! Great banner ... love the boa. Thank You for being in the hop and for a chance to win cool prizes. What a nice and festive banner - great job! TFS your talent in this blog hop. Of all the banners so far this is my fav! Great idea. Your banner came out super duper cute!! Love all the details you added! Great job girly!! MISS GALE!!!!! How the heck did I not know you had a blog girlfriend!!!!!! LOL....I am totally following you here now too =) Your blog is ADORABLE!!!! I cant get your video to work...I am off to YouTube to check it out...I saw a little glimps of a martini glass....I am so excited!!!!!!! So glad to be a part of this hop with you!!! Love the feather boa! You banner is so much fun!! Thanks for sharing and good luck with the house. What an adorable idea! It's a must now for me to recreate! I'm sorry to hear about the flood at your house! I love your fun banner! Thanks for sharing your video. So awesome...just became a follower! So nice to have a homemade banner for the New Year! Great colors! Thanks for a great giveaway! This is amazing!So original and sparkly. Love the boa too. I really like the colors you used and the way you put it all together, very cute! What a super fun banner, Miss Gale! Love it, girlie! It's been so much fun hopping with you! You had me at Glitter!! Love the feathers!! TFS!! Take Care!! VERY CUTE! I love the super girley colors too! I like! Great paper pack. Thanks for sharing! Love that boa on your banner! It's definitely cheery! Thanks for a great giveaway. Happy to follow! love the banner.. very cute.. thanks for sharing..
super cute, love the frilly white feathers and the top, very girly !!! glad to be in the hop with you ! Cute New Years' banner! We have an annual New Years' Eve party and that would look great at our house. Thank you for sharing and for the chance to win your fabulous blog candy. Gale- first time to your site, and already a follower. Just loved your version of banner. How cute. Martinni glass was definitely an original. Sorry about the flood. How terrible! Glad you made the hop. I am sorry to hear about he flood damage. Praying for you and your family. You made a beautiful banner, very creative! Too cute!!! Thanks for the blog candy!!! I am a follower! What a sweet banner! I LOVE IT!! Great idea and really inspiring. What a cute banner! I love the clothes pin idea!! Oh WOW!! I LOVE THIS! This is something I will for sure make. I am a new follower, I have looked at some other projects you made, and I love your work! I'm a follower. Fantastic banner. Beautiful banner! I love the festiveness of the colors! Thanks for sharing! Very Cute Banner! 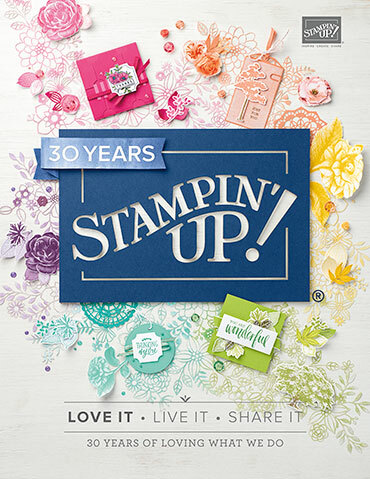 Love the Blog Hop! TFS! How fun and sparkly! I am going to use your idea to create a banner for my future daughter in laws bachelorette party. Oh My Gosh.....I love it, I love the martini glasses, what a great idea, TFS!!!!!! This is amazing, thanks for the great idea! Your banner turned out awesome! I love it! Love your banner, never thought of doing one for New Years. This is so fun and festive! Love the fantastic colours! Very cute. never thought of new years. tfs. great job. New follower here...your banner is adorable! It really came out festive and with the right colors... I love it! Ps. Sorry to hear about your house. Wonderful and festive banner. Love it! So very festive! I am a follower. I love your banner! Thanks for sharing it. New follower here thanks to the blog hop :) I love the New Years banner..I never would have thought of it, but now may have to make one. Thanks for sharing. This timre of year is the best. Sooooo inspiratioal. 2cute and so original. Thanks for sharing your talent with us. So sorry about your home, praying for you and your family. Super cute banner. TFS! I am now a follower! Love the banner!! I am so inspired to run off and make my own..but I will wait until I am done with the hop. Sorry to hear about you house being flooded! I hope things are going well! Thanks! Such a fun banner. I really love it. OMG!!! What a fun banner, I love it! Thanks so much for sharing. What a great banner Gale... I hope things are getting cleaned up at home.. sorry to hear about your flood!! What fun! Great Banner!!! Glad to be your newest fan. Very cute banner - great idea. I will have to try and make one of these. Thanks!! Hi Gale! Your Banner is super cute! Love the feather boa and the glittered clothes pins. Great job!! Love your banner and great blog candy! Oh I love this. I am so amazed by all the banners so far. I love the New Years idea and your wonderful video. Thanks! Hi! I'm new to your blog. 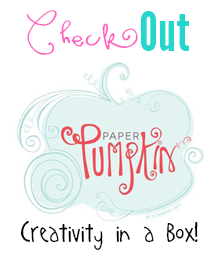 This blog hop is so much fun! Wonderful banner! What a creative idea! I am a follower!